Halloween is one of the most popular holidays in the United States. In 2016, approximately 170 million Americans celebrated Halloween, spending a total of $8.4 billion. This year, that number is expected to reach $9.1 billion. Needless to say, Americans are feeling the Halloween spirit, and your brand should follow suit. Incorporating Halloween into your social media content will help your business engage with followers who are in the festive spirit. An easy way to incorporate Halloween into your brand’s social media is to create visual content centered around the holiday. Whether it’s a graphic wishing followers a happy Halloween, a festive cover photo, or a post about a Halloween special, you can create content that is sure to grab your followers’ attention. Photo contests are a great way to engage with your followers and encourage user-generated content. And during the Halloween season, there are plenty of options when it comes to the kind of photo contest you host. Your business could host a Facebook costume contest where followers show off their costumes, or an Instagram contest for the best jack-o-lantern using a branded hashtag. Try to find a way to make the contest and prizes relevant to your brand. 3. Promote an in-store or online special. Give your customers and followers a Halloween treat by offering a seasonal coupon or promotion. Whether promoting an in-store special or offering a special treat to your social followers, promoting discounts will attract more engagement from your followers. Even if your organization has no connection to Halloween, you can incorporate the holiday in some way. Try offering “scary good” deals or including a Halloween-themed freebie with purchase. There are plenty of ways for your business to get in the Halloween spirit. 4. Share Halloween-focused tips and advice. Perhaps one of the easiest ways to incorporate Halloween into your social media content is to share relevant tips and advice. The type of advice you share may depend on your industry, size, and location. If you have a local following, establish your business as a community resource by sharing events going on around town or the best places to find a costume. For larger, national organizations, offer valuable advice by sharing decorating ideas or safety tips for Halloween night. 5. Show how your team gets in the Halloween spirit. Sharing photos of your team is a great way to connect with your audience and show them the human side of your organization. Connect and engage with your followers by sharing how your team celebrates Halloween, from office parties to employee costume contests. Showing how your team gets in the Halloween spirit is fun not only for your audience, but your team, too. Holidays like Halloween offer the perfect opportunity to have fun with your social content and to showcase your business’ personality. By following these tips, you can connect and engage with your audience, making the most of this fun time of year. 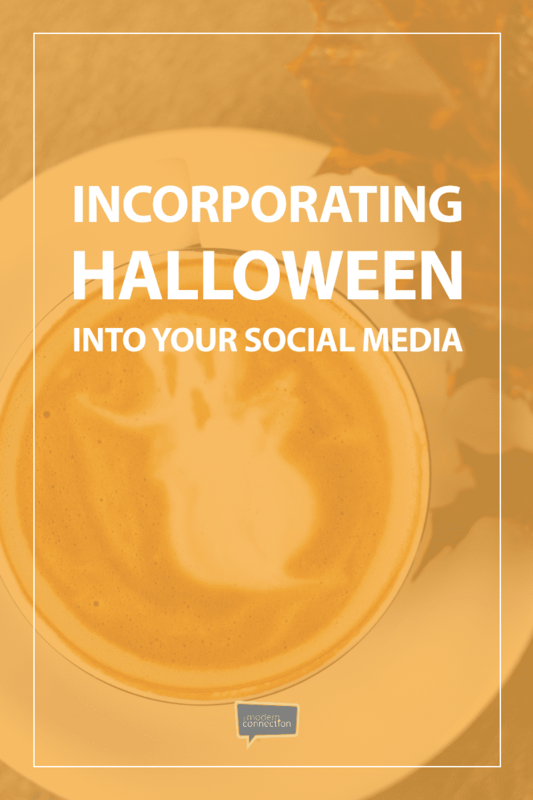 Want more ideas for using Halloween in your social media marketing? Download our Halloween guide below. Complete form to receive Halloween in Your Social Media Marketing right in your inbox! Camilla is a Social Media Manager at The Modern Connection. Having graduated from the University of Georgia with a degree in English, Camilla combines her passion for writing with her love of social media to create relatable, engaging content across social platforms. A Charleston native, you can find Camilla by the water with friends or family when she's not behind the screen.